Those initial few months after you say, “I do,” are an exciting time. You’re newly married, are likely jetting off to a fabulous honeymoon, and enjoying the pleasure of opening an array of gifts. Not to mention the fact, that you’re probably still high on love. Of course, while those first few months are no doubt filled with love and adoration, they’re also a period of adjustment. This is especially true if you and your partner are just now moving in together. You’ll be truly getting acquainted with all of your spouse’s habits. You’ll be taking care of all the legal matters (like changing your name or filling out forms). But, most importantly, you and your spouse may also begin to merge your finances into one. Although this might seem like a menial task, money and sharing an account is often a problem for newlyweds. To help alleviate the stress that can come with merging your finances as newlyweds, follow these six steps. The first step you should when you merge your finances is to merely have a conversation about money. To be honest, this is a step that’s best taken before you tie the knot. But, if you haven’t done it, have this conversation now. Sit down and discuss where you’re both at in terms of income and debt. Moreover, as you move forward together, you both need to be aware of what each person is paying for. This is especially true any accounts or bills that might be taken out automatically. You should also work to understand each other’s lifestyles. You might both have very different ideas about spending and saving. This is why it’s important to work toward a compromise and reach the same page. That way, when you merge your finances, you won’t run into any major arguments or discrepancies. Your next step to financial harmony is to decide how you want to handle your finances. Traditionally, couples have merged their bank accounts into one joint checking account instead of each keeping their own. But, in 21st Century America, that’s not necessarily the case anymore. There are definite pros and cons to various paths. Nowadays, you can have a joint checking account, simply keep your own, or even have a combination of both. Whatever route you choose, you merely have to pick one. So, decide what option is best for you and your spouse and make a move in that direction. When you were single, you likely had financial goals of your own, or at least you should have. Now that you’re married, some of those financial goals are probably going to change. Or, they may just mold into something a little different. As merge your finances, you’ll want to have joint financial goals as well. Take time to work together to decide what some of those goals might be, so that you and your partner both know what you’re working toward. You might still have the goal to eradicate debt or buy a house, but now you might also want save up to have kids or pay for their college tuition. Figure out which short-term and long-term plans are important to you as a couple and then create a plan for accomplishing those. One of your most important goals, of course, should be to create an emergency fund. If you each already possess one of these, you could simply merge them together. However, if neither of you possess an emergency fund, or only one of you do, then you’ll need to strategize for either creating one or increasing the amount in your emergency fund. After all, you want to be prepared should either of you lose your job or if the unplanned and unexpected occurs. An emergency fund serves to prevent any added stress to your new marriage should your finances take a hit. Again, you most likely had a budget just for you, but since you’ll be merging bills, expenses, and possibly accounts, you’ll need to create a budget that works for you both. While some categories like food, gas, or possibly entertainment might go up, there are others that might not since you’ll be paying one bill, together, with two paychecks. Go through each category, all your discretionary and non-discretionary expenses, and decide together what you can and want to spend in each. After creating your initial budget, it might also be a good idea to check back in halfway through the month to see how you’re following it. That way you can make changes if necessary. Although there’s no rule that states only one person has to be in control of your finances, you should make a point to decide who will manage them day-to-day. Or, if you both want to contribute, who will be responsible for what. Figure out who will pay the bills, handle the grocery shopping, keep track of the budget each month, or who will deal with taxes. Again, you can decide to do this together or split it up as well. But, nonetheless, it’s a good idea to have a plan so that you’ll know it’s always taken care of. For most people, life as a newlywed is a time filled with excitement and new experiences, which for the most part are good. That being said, marriage is filled with a lot more than honeymoons and love, it tackles the hard stuff as well. No matter where you are in life, money is bound to be one of those things that falls under the hard stuff. Plus, in many cases, it’s one aspect of life that can cause stress in a new marriage. To prevent that from being the case in yours, take the time to create a plan and follow a few simple steps to successfully merge your finances. 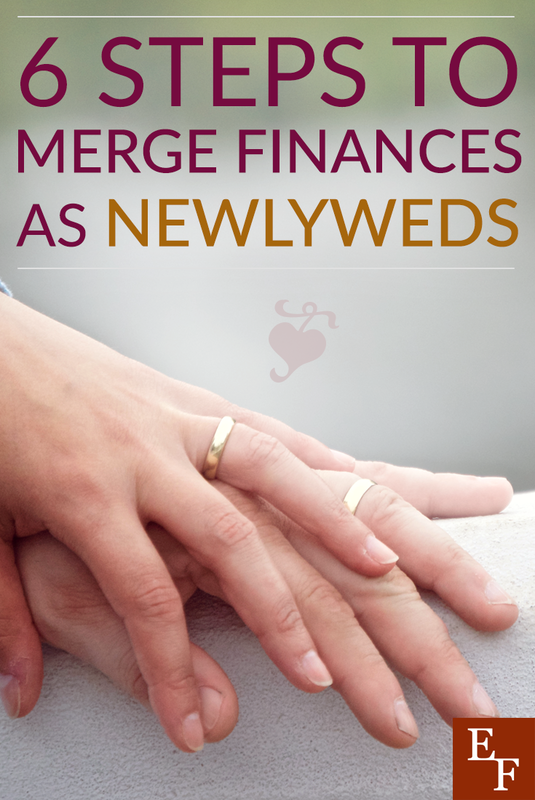 Did you merge your finances when you got married? If you’re getting married, would you rather create a joint account or keep yours separate?